Version 7.0.x.23 of GTViewer is available. - FIX - Certain Additional Properties section attribute were not carried from a .gtx file created from a .gtx file. - FIX - The GTFieldFilterString is limited to 255 character. Another entry called GTFieldFilterString_Continue can be used repeated to add more lines of information in the Additional Properties section or in the addprop.ini file. - FIX - The FilterTooltip_Pre entry has been added to allow FilterTooltip entries greater than 255 characters. - FIX - GTV #1001 - The ReQuery button in the Query Results would only repopulate the first 3 prompts for regular queries (Thematics Queries were not being supported). Now, Thematic Queries and any number of prompts are supported. - NEW - GTV #1003 - Feature Tooltip now allows an =, :, or - to be placed after the attribute label. If no separator is provided, the default = will be used. - NEW - GTV #1004 - The Feature Count Options dialog now supports a horizontal scrollbar in the listbox of features. - FIX - GTV #1005 - Fillable elements were not inverting the element color when drawn on a background of the same color if the border color style were used. Everyone who came to booth 2309 at the DistribuTECH conference was complimentary about GTViewer's snappy performance and intuitive interface. Whether showing 3-inch color aerial photography on a hand-held device or showing gigabytes of GIS data on a laptop, "That's fast," was the most frequent comment. 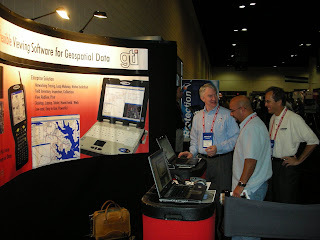 GTI will be in booth 2309 at the DistribuTECH conference in Tampa, Florida, January 22-24. Come visit and see why so many people are excited about the performance and ease of use that GTViewer brings to the world of mobile mapping. Version 7.0.0.4 of GTData is available. - FIX - GTQuery - If the Feature entry were used without a FilterFile entry, an error message is now displayed instead of processing the file with no records being processed. - FIX - GTExtract - Extracting data with Double Ellipse elements (Type 106) would cause problems. - NEW - GTDataSum - Added to GTData to find the number of tables, the number of records in each table, and the size of each table in a data.txt file. Version 7.0.x.22 of GTViewer is available. - CHG - The DefaultMode 1 for did not apply FilterMap entries. It will now apply any applicable FilterMap entry and default to the source element's styles otherwise. - FIX - Dgn Exporter was not computing Cell Header ranges correctly for stroked symbols. - NEW - DGN Exporter now supports an IgnoreSymbolJustification entry. - FIX - DGN Exporter now supports FontMap entries for Symbol elements. - FIX - Extracting data with Double Ellipse elements (Type 106) would cause problems. Version 7.0.x.14 of GTVx is available.